Starting today, I am officially on vacation! However, though I’ll be away for two weeks, I’m not going to let that stop me from sharing my thoughts here on the Shattered Lens. What can I say? I love film, I love this site, and, most importantly, I love our readers. Now, if you know me, you know that I also love to dance. So, I figured, why not combine my greatest loves? For then next two weeks, I will be sharing a special set of scenes that I love. These are some of my favorite dance scenes. I’d like to start things off by sharing a scene from my favorite film of 2012. This deliriously romantic dance scene comes from Joe Wright’s brilliant adaptation of Anna Karenina and features Keira Knightley and Aaron Taylor-Johnson. As of this month, I have been reviewing films here at the Shattered Lens for 3 years. In honor of that anniversary, I thought I’d post my picks for the 50 best films that have been released in the U.S. since 2010. Best Documentary Feature — Searching For Sugar Man. Today is the last day for the members of the Academy to vote for the 86th Annual Academy Awards. With that in mind, here are my predictions as to what’s going to win next Sunday. Please note: this is not necessarily who I think should win. With the Oscar nominations due to be announced this week, now seems like a good time to indulge in something I like to call “If Lisa Marie Had All The Power.” Listed below are my personal Oscar nominations. Please note that these are not the films that I necessarily think will be nominated. The fact of the matter is that the many of them will not. Instead, these are the films that would be nominated if I was solely responsible for deciding the nominees this year. Winners are listed in bold. For those who are interested, you can check out my picks for 2010 by clicking on this sentence. Meanwhile, my picks for last year can be seen by clicking on this sentence. Matthew McConaughey in Killer Joe. Without further ado, here are my picks for the 26 best films of 2012! For the most part, 2012 was a bland year as far as cinema is concerned. The most acclaimed films of the year (Argo and Lincoln being two obvious examples) were well-made and often entertaining but they were hardly revolutionary. 2012 was the year that the establishment told us what we should enjoy and, for the most part, film critics slavishly hopped on the bandwagon. As you can probably guess, 2012 was not my favorite year as far as the movies are concerned. That said, there were a few films that gave me hope. As the year ends, despite being underwhelmed by most of the films that were released, there are a few that I truly did love. Anna Karenina is, of course, based on the classic novel by Leo Tolstoy. Anna Karenina (played, quite brilliantly, by Kiera Knightley) is the wife of the noble (but somewhat boring and judgmental) Russian statesman Alex Karenin (Jude Law, who is also quite brilliant and rather tragic in a role that, in lesser hands, could have become a stock villain). When Anna’s good-for-nothing brother (played in a wonderfully comedic performance by Matthew MacFayden) is caught cheating on his wife, Anna leaves her safe home in St. Petersburg and travels to Moscow where she helps to save her brother’s marriage and meets Count Vronsky (Aaron Taylor-Johnson). Among the members of the Russian high society, it is well-known that Vronsky is pursuing the hand of the young and beautiful Kitty (Alicia Vikander, who generates a lot of sympathy for a character who, at the start of the film, could easily have been portrayed as just a spoiled brat). However, at the ball where it is widely expected that Vronsky will ask Kitty to marry him, Vronsky creates a scandal by dancing with Anna instead. Vronsky loses interest in Kitty and instead, he now obsessively pursues the married Anna. Though Anna is resistant at first, she finally gives in and embarks on an adulterous affair with Vronsky, resulting in scandal and tragedy. Again, history repeats itself. The story of Anna Karenina is a familiar one that has been told repeatedly over the ages. That’s one reason why Tolstoy’s novel has remained one of the greatest novels ever written and why it has been adapted into so many other mediums. Director Joe Wright begins Anna Karenina with the assumption that the majority of the people in his audience already know the story of Anna’s ill-fated love affair with Vronsky. As such, he puts less emphasis on the story itself and more on how the story is told. Anna Karenina is a masterpiece of style. When the film opens, Wright has his actors literally performing on a stage. When Anna travels to Moscow, a miniature train is seen rolling across the stage. When the scene changes from a factory to a high society ball, the factory workers walk backstage, change costumes, and then step back onstage, suddenly transformed into noblemen. At one point, we even see a janitor nonchalantly cleaning up the now-empty theater while the story continues to play out on the stage in front of him. When Anna and Vronsky dance for the first time, the other actors freeze in place and a spotlight shines down on the dancing couple. It’s an amazingly romantic moment, one to which anyone who has ever been infatuated will be able to relate. Finally, a door opens onstage and the characters (and the viewing audience) are able to step out into the “real” world but, throughout the film, we occasionally return to that stage. While several critics have criticized this aspect of the film, I thought it was brilliant. By literally putting his actors on stage, Wright both acknowledges that this is a story that may be familiar but can be interpreted in many different ways and he also drives home the point that, ultimately, we are all just actors on a stage, being observed and judged by a society that is often hostile to any sign of individual desire or unpredictable emotion. Needless to say, the film’s extreme stylization is not for everyone. That’s actually one of the reasons that I love this version of Anna Karenina so much. In a year that was almost excessively safe, Joe Wright took a risk and, as a result, encouraged us to look at a familiar story in a different way. 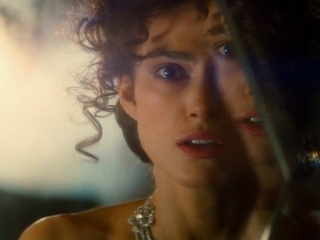 For that reason, Anna Karenina is my favorite film of 2012. * For the record, my second favorite film of 2012 was The Cabin In The Woods.